The three (3) week* Nurse’s Aide (NA) program is designed to provide students the knowledge and skills needed to perform basic nursing care. 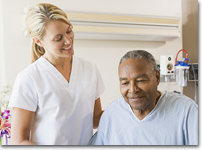 What does a Certified Nurse's Aide do? Students learn to take and record vital signs, and assist patients with daily activity and recovery needs, and prepare to take the Connecticut Nurse’s Aide State Exam. For your convenience, this exam is offered on campus at American Institute, so you can take your certification test upon completion of your training. This program is offered in day, evening, and weekend schedules, allowing you the flexibility you need to manage your current work/life demands while you train for your new career as a Nurse’s Aide. American Institute has been approved by the State of CT and the Department of Public Health to offer the Nurse's Aide Program. American Institute programs are approved for WIA funding, but does not guarantee the WIA funds will be available at the time of enrollment.